Excitement followed by immediate disappointment is what we experienced when we initially learned about the new Civic. 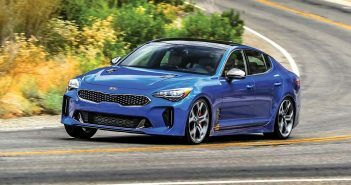 We were ecstatic to hear that it would be turbocharged but those happy feelings were quickly deflated when we realized that it was only offered with a continuously variable transmission (CVT). After enough backlash (or perhaps as a result of Honda’s marketing strategy), Honda announced that the 1.5-liter turbocharged engine could be had with an optional 6-speed manual transmission. Our faith in humanity was restored as we planned to get a Civic on our dyno and begin testing the car’s response to modification. To establish baseline power figures on the factory 10th-gen Civic, we strapped the car onto DSPORT’s Dynojet 424xLC2 Linx chassis dyno. With the car in third gear, the Civic laid down a healthy 187.39whp at 5,550 RPM and 182.97 lb-ft at 5,560 RPM. This was a surprise since Honda claims the stock power output to be 174 hp and 162 lb-ft of torque as tested with the CVT. While this slight boost in power could be due to the difference in power transmission through the drivetrain, it could also be attributed to the variation in boost pressure. Honda sets the factory wastegate pressure for the L15B7 engine to 16.5 psi. We recorded a peak of 18.6 psi during our baseline runs. With Doug Macmillan of Hondata on hand, we decided to first address the Civic’s factory engine mapping by using a Hondata FlashPro tuner. With a simple connection from a laptop USB port to the vehicle’s OBDII port, we utilized the FlashPro Manager software to reflash the car’s ECU. The new map was selected from several built-in calibrations that are programmed for various intake designs and boost levels. 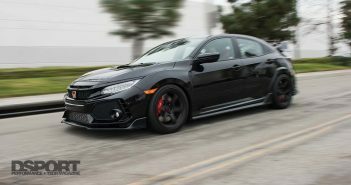 With the resulting changes in ignition and camshaft timing along with a slight increase in boost pressure, the Civic pushed out a peak of 197.12whp at 5,400 RPM and 218.51 lb-ft of torque at 3,000 RPM. Boost pressure checked in at a maximum of 23.26 psi. 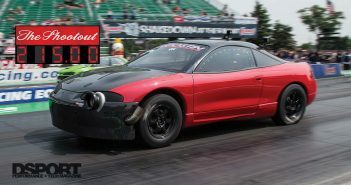 This single modification showed tremendous improvements under both the horsepower and torque curves with increases of approximately 10whp and 35.5 lb-ft of torque. By analyzing the readings at the airflow meter, it was apparent that after 5,500 RPM, the incoming air graph was fairly flat indicating that the Civic’s turbocharger was reaching its maximum potential. 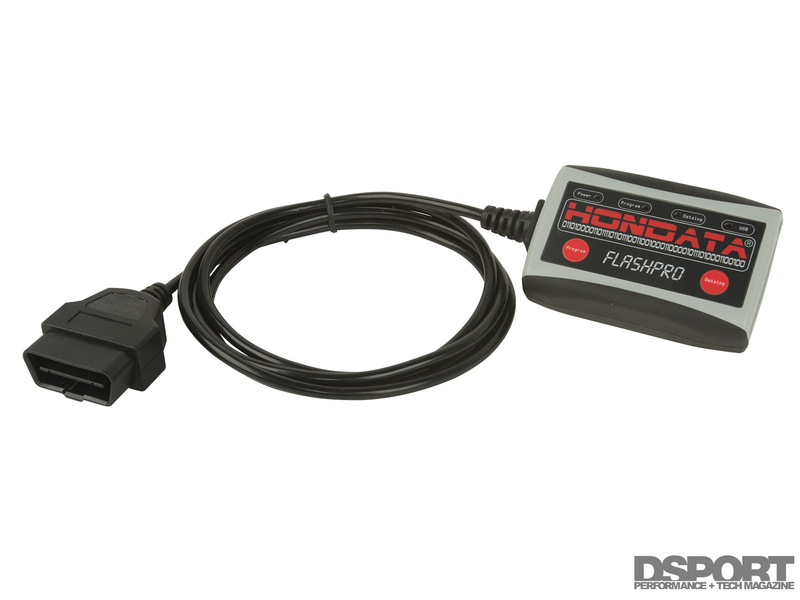 The Hondata FlashPro is capable of reflashing the factory ECU and other functions such as datalogging, checking/clearing diagnostic codes, displaying custom gauges and more. Wanting to increase the volume of air into the engine, we installed a Mishimoto performance air intake system. This kit encloses the air filter within a shielded airbox to minimize the transfer of warmer ambient engine-bay temperatures and allow for cooler inlet air temperatures. The design seemed to do the trick as we logged a 10-degree drop in inlet air temperatures from both inlet temperature sensors along the Civic’s airflow path. 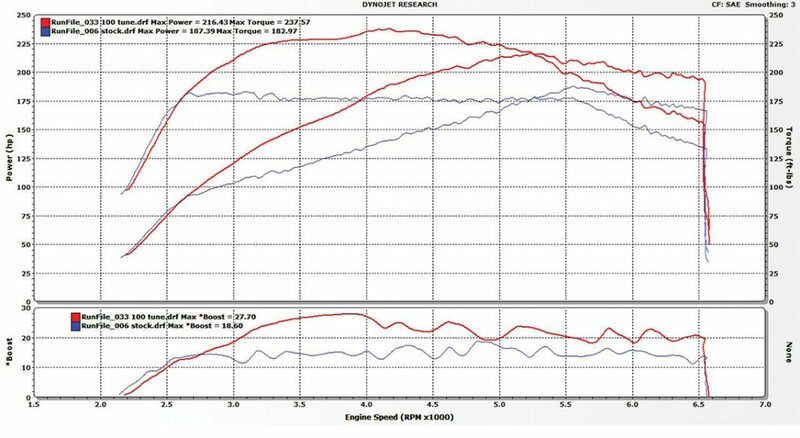 With the intake in place, power output increased once again to 205.37whp at 5,200 RPM with gains seen in both power and torque in the higher RPM range. Separating the air filter element from the high temperatures in the engine bay can result in cooler air inlet temperatures reaching the throttle body. 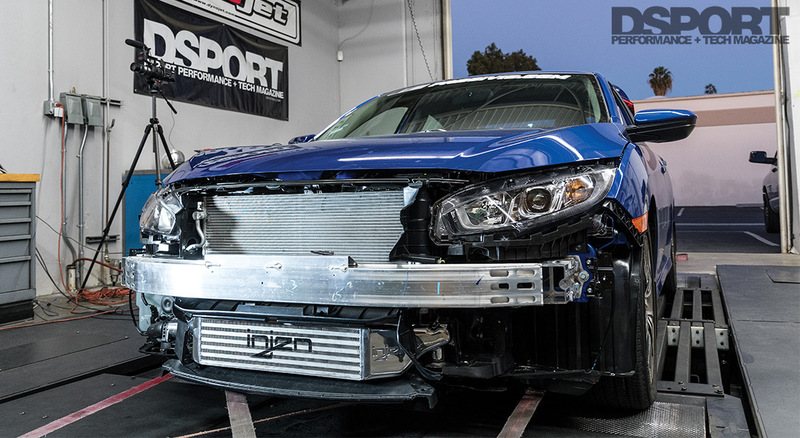 Since we experienced significant gains by modifying the air intake tract, we opted to use an Injen SES intercooler system to replace the factory Honda counterpart to further improve the air inlet dynamics. Upon a quick visual, the Injen intercooler appears to be roughly twice the thickness of the stock core. This additional surface area should assist in the thermoregulation of inlet air temperatures during demanding driving conditions. After some user error during installation, Paul Ho from Injen’s Research and Development team pointed us in the right direction. Take it from us and make sure to transfer the intercooler O-rings from the stock intercooler to your aftermarket cooler. The Injen intercooler provided clear gains along all points of the graph. The data showed a slight increase in the volume of air entering the engine and a slight decrease in the inlet temperature of that air volume. We once again analyzed the data from the Civic’s two air temperature sensors. The first sensor (IAT1) is located near the air filter and IAT2 is in the charge pipe before the throttle body. 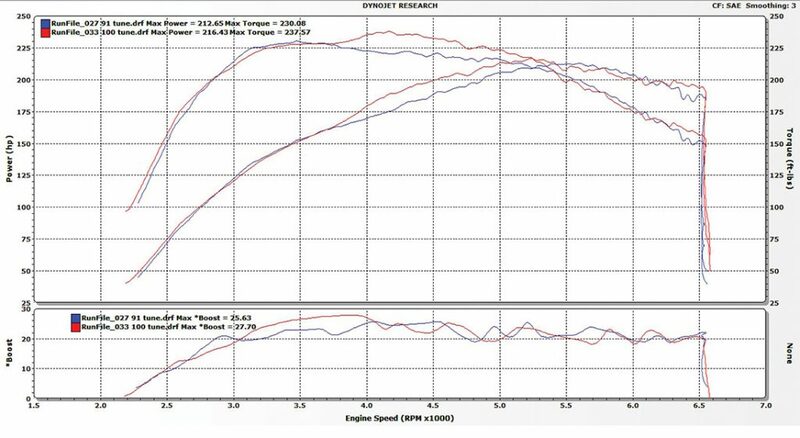 The numbers showed that both the Injen intercooler was capable of cooling temperatures recorded at IAT2 to several degrees below those read at IAT1. These sensors allowed us to verify that the Injen intercooler was in fact delivering cooler air into the throttle body and avoiding any heat soak state. The Civic’s dyno passes also confirmed the gains with wheel horsepower checking in up to 209.20 and torque hitting 222.95 lb-ft. The Injen front-mount intercooler is a direct replacement for the factory core. The upgrade packs in roughly twice the surface area for optimized air inlet temperatures. With all the components installed on the car, we once again flashed the factory ECU to find the optimal performance from this specific combination of parts. The result was worthwhile as the tune delivered a smoother curve from 3,100 RPM until the redline of 6,500 RPM. 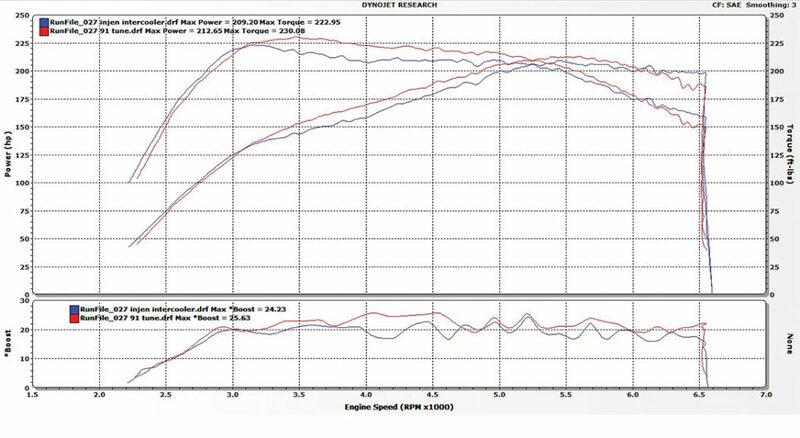 A slight increase in peak boost pressure from 24.23 to 25.63 psi coincided with a jump in horsepower and torque to 212.65whp and 230.08 lb-ft.
Aside from selecting from several built-in pre-programmed calibrations, tuners can use the Hondata FlashPro Manager software to create custom tunes. All the dyno runs until this point had been done on California 91 octane fuel. 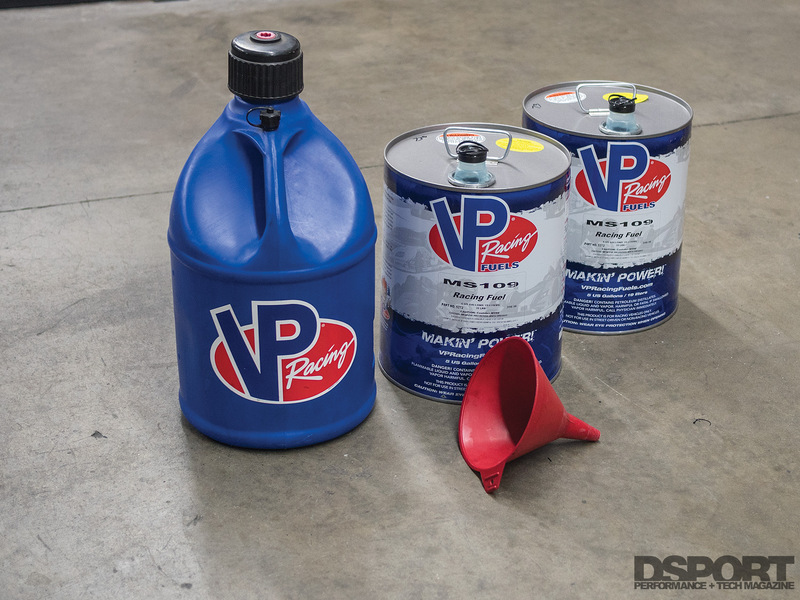 To see what the L15 engine could with increased octane, we added 10 gallons of VP Racing MS109 fuel to the tank that had two gallons of 91, which resulted in a blend of 102.5 octane. After just three to four minutes of loading the Civic on the dyno, we observed the knock control drop further to 54-percent. To take advantage of the decreased knock, we employed the Hondata FlashPro Manager for a custom tune. We added boost pressure in the mid RPM range which added torque from approximately 4,000 to 5,000 RPM. Power beyond the 5,500 RPM mark was essentially unattainable due to the small TD03 turbocharger running out of steam. After some fine tuning to balance between adding boost pressure and ignition timing, the final number came in at 216.43whp at 4,100 RPM and 237.57 lb-ft of torque at 5,200 RPM. This nets a total peak gain of 29.04whp and 54.6 lb-ft of torque. Using higher-octane fuel can allow for increased performance if the vehicle’s computer reacts in the desired way. In the case of the Civic, knock control decreased and allowed for more boost pressure in the midrange. With just shy of 30 additional wheel horsepower on tap and a massive gain of 54.6 lb-ft of torque, we’re impressed with the performance capability of the new turbo Civic. Straight from the showroom floor, this iteration of the Civic easily beats all previous generations making it even more rewarding to modify. It’s apparent however that the factory single-scroll MHI TD03 turbocharger is inadequate at performing much beyond the factory settings. For anyone looking to make more power, a bigger turbo is a requirement, but we’ve never shied away from that. Stay tuned for further testing on the new Civic.